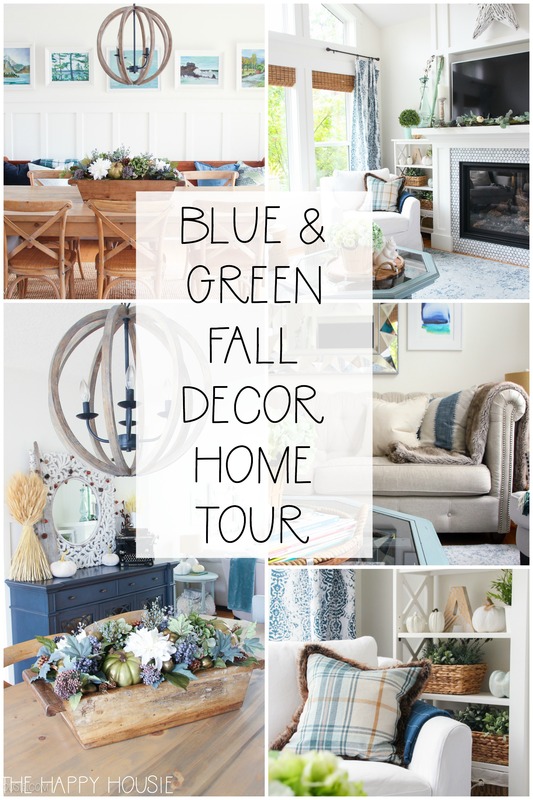 Today I’m sharing our blue and green fall decor home tour as part of the Seasonal Simplicity Fall Home Tour series, with homes being shared all week long by 36 talented bloggers. It’s days away now, friends. Fall-slash-Autumn is nearly on our doorsteps. Truthfully, it already feels like fall around here. We’ve had insane amounts of rain and much cooler temps for the last several days. But…. shockingly….I’m loving it! This past weekend I dug out the coats and scarves and cozied up at the soccer field in my Hunter boots. This is our reality for the next several months, so might as well embrace it, right? 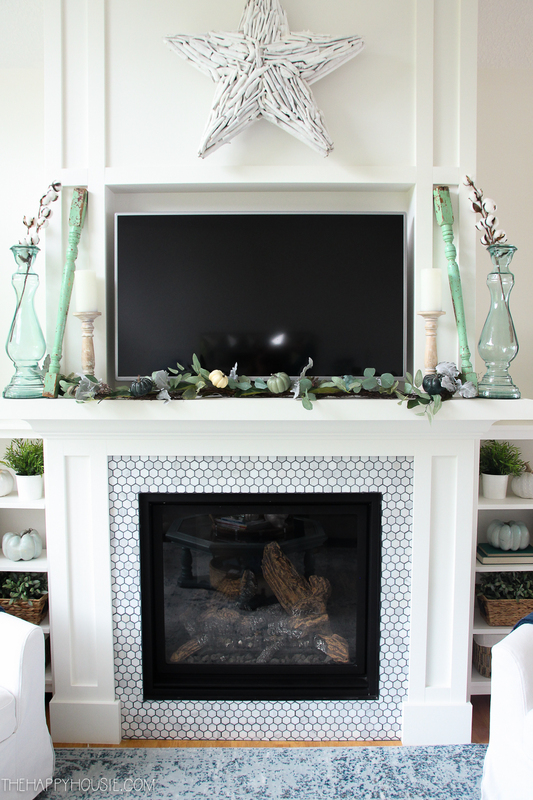 And just like I chose my Hunter boots in a dark blue/teal colour; our interior fall decor follows much the same pattern. Blues. Greens. 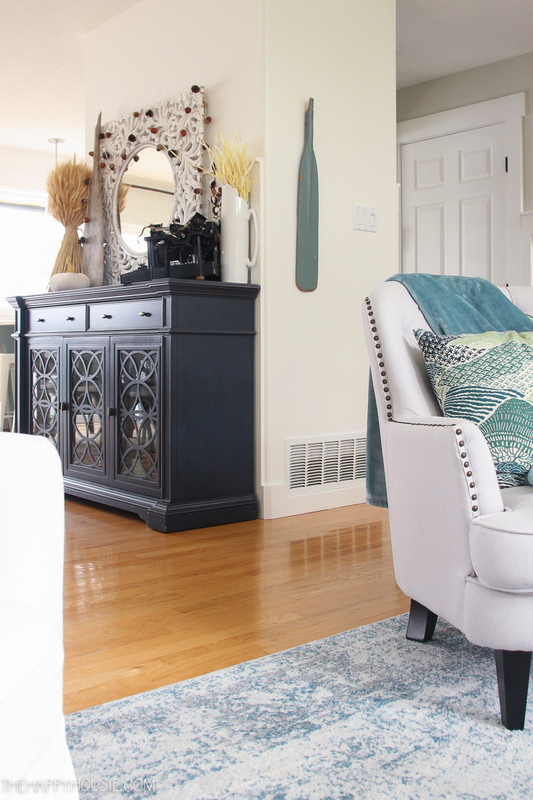 Lots of pops of natural wood/basket/wicker/rattan kinds of tones to warm things up. And a solid background of off white (simply white, that is). 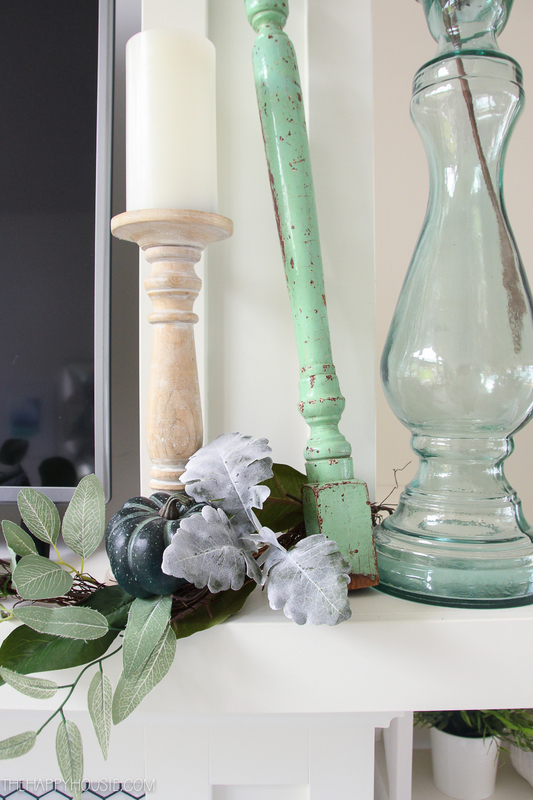 It all makes for a colour scheme that I am definitely loving for the Autumn. Cozy yet fresh. Calm and welcoming. 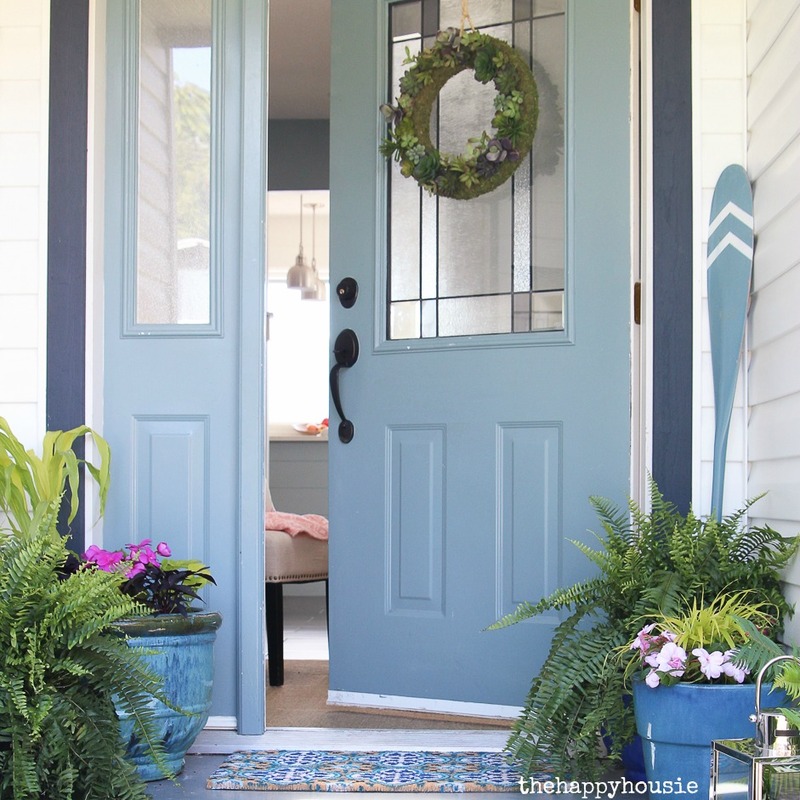 Perfect for this season when we transition our lives back to the indoors. If you are new here, then welcome! 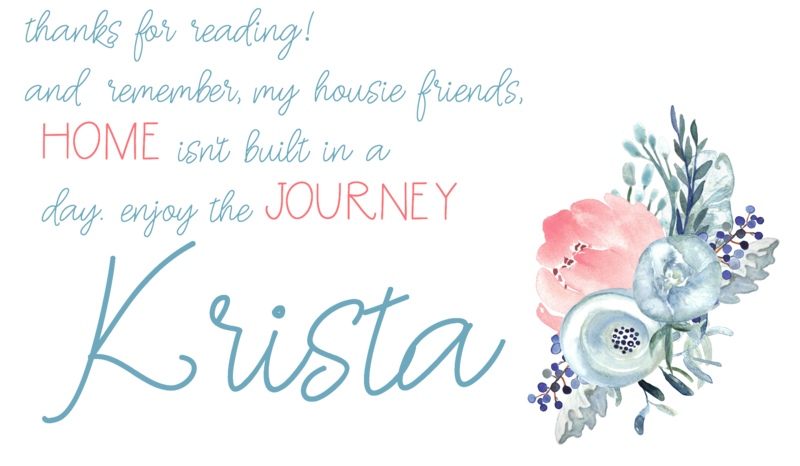 My name is Krista and I’ve been blogging in this little corner of the internet for about six years now. 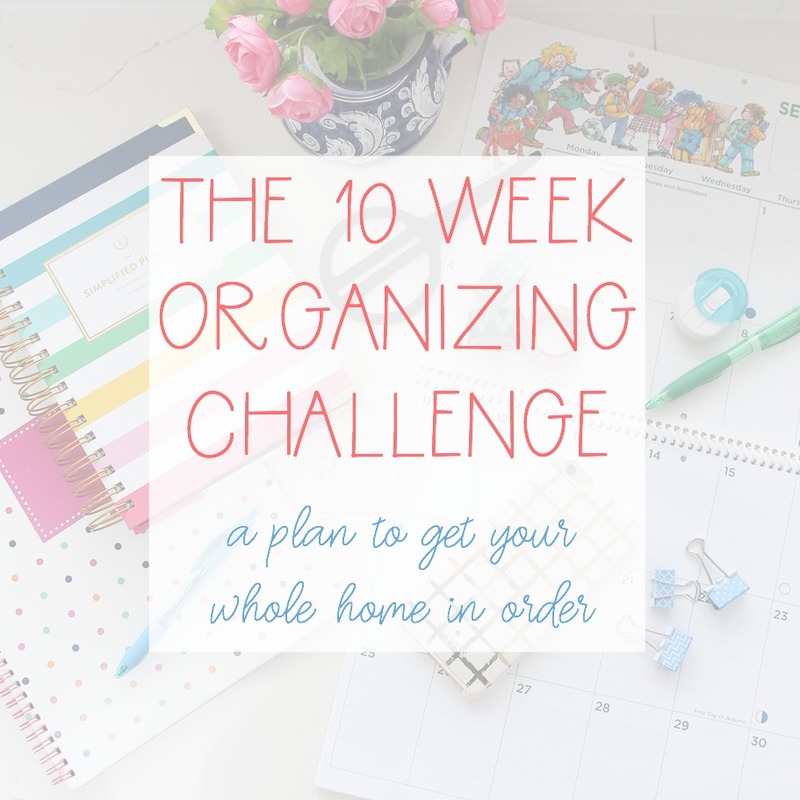 I love to share decorating, crafts, DIY , printables, and I’m a out-of-closet organizing nerd. 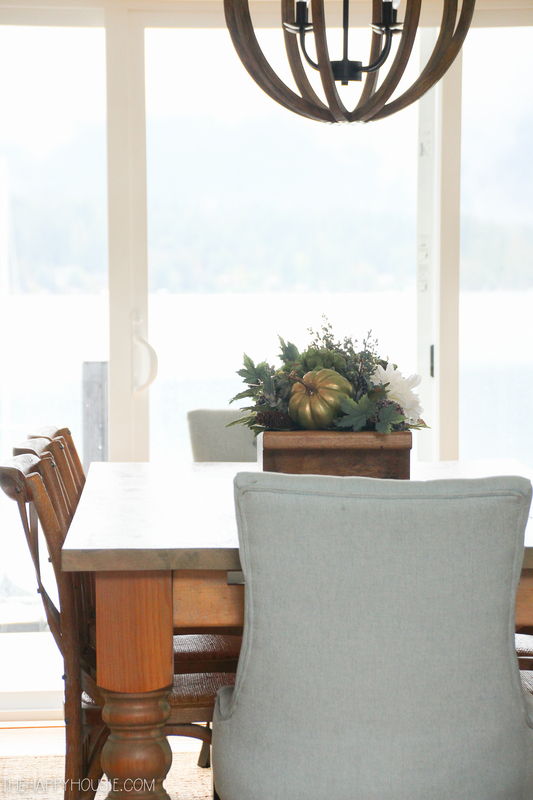 I’m all-around in love with all the things we do to make our homes special havens for the people we love. Read more about me and this blog here. I’m the host of the Seasonal Simplicity series, and am honoured to be hosting this week’s tour with so many talented bloggers. You can find who all is sharing this week at the bottom of this post. Not too much is new for this season. I kept our overall look fairly similar with #alltheblues and just switched up my accessories to give it a more fall feel. 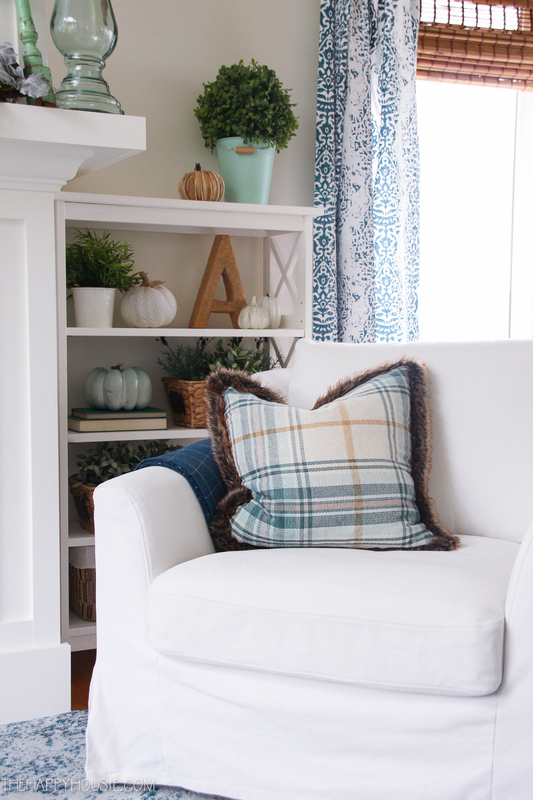 I added back some cozy fur as well as plaids in pillows and throws, and pumpkins adorn nearly every surface. I mean, what more do you really need? I love the coziness of these sweater pumpkins – I shared the tutorial for them here. 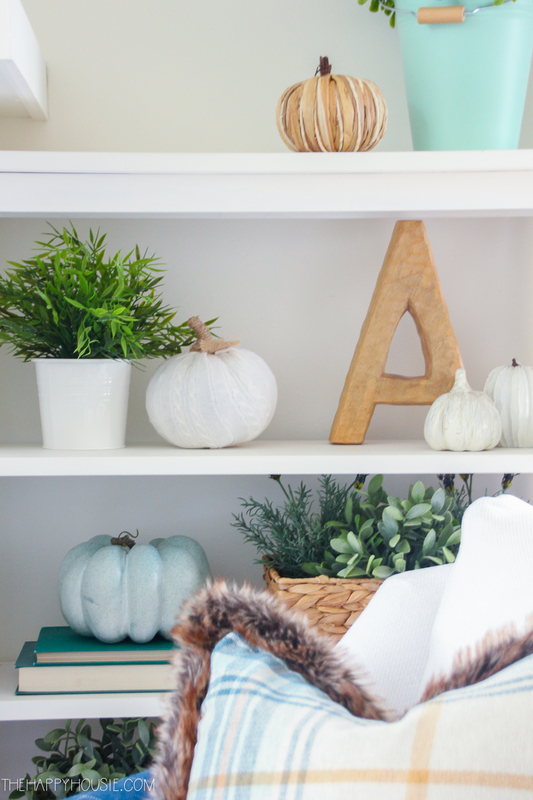 Such a fun and thrifty fall craft! I’m pretty excited about this dough-bowl situation. I shared my tutorial and video for it here. 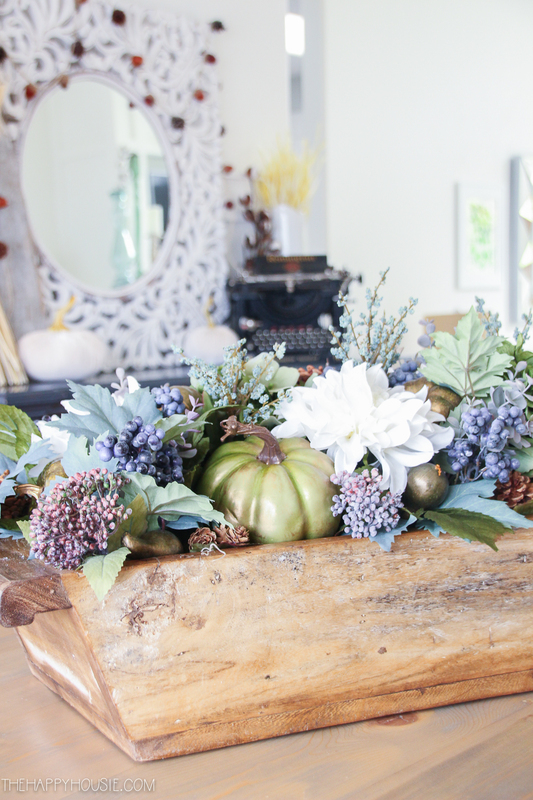 I shared all the details about this fall vignette the other day. The typewriter might be my favourite part. Yours? I only made a couple of little changes in the kitchen. The new tobacco basket from Michaels over the stove. 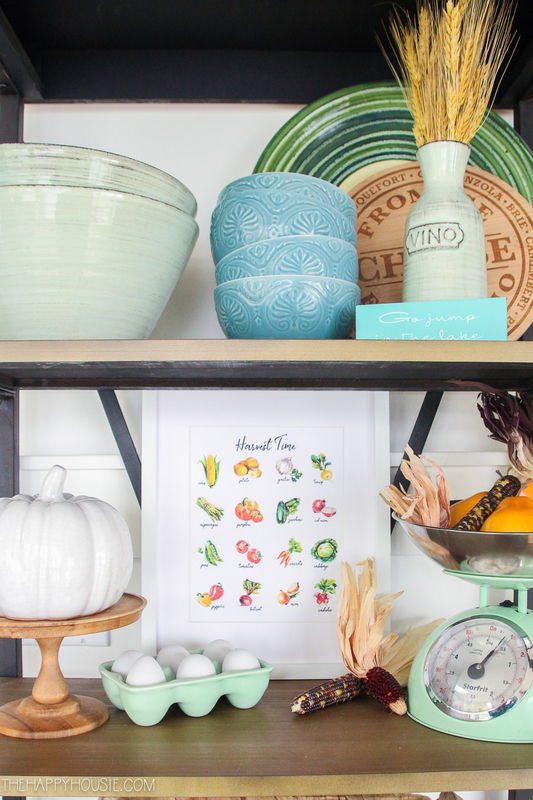 And you may have seen the Harvest Time printable already? 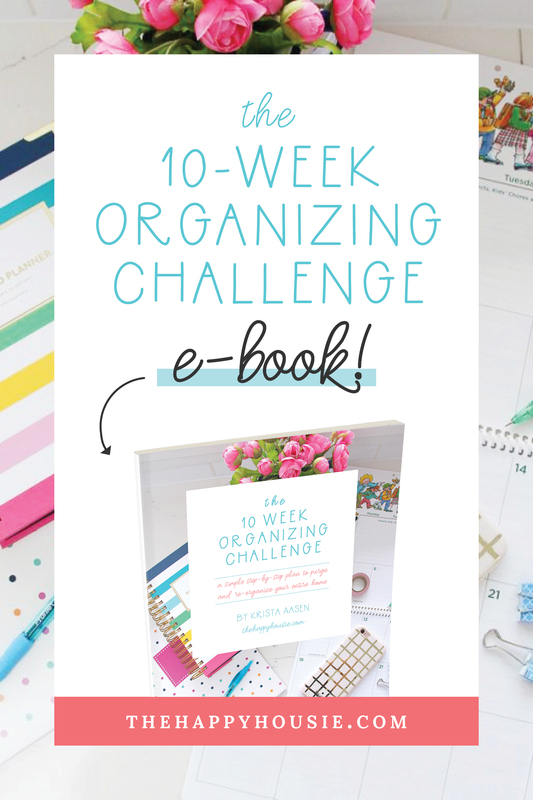 Head over here to download my free Harvest Time printable! And now!! 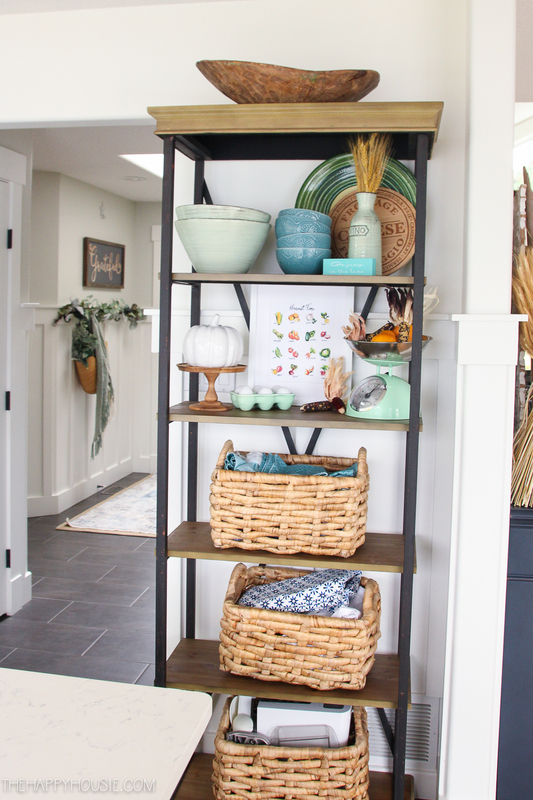 Next up on today’s hop is a beautiful blue-filled home tour with gorgeous touches of copper – head over to see what inspiring ideas Jenna Kate at Home has in store for you! You are so skilled! Every photo has such a fabulous arrangement. I would have never had thought to use blue in autumn, but it works so well. Can I ask.. where did you get your wooden caged light shade from? I’m in the UK so I’m really hoping It’s not a local store! 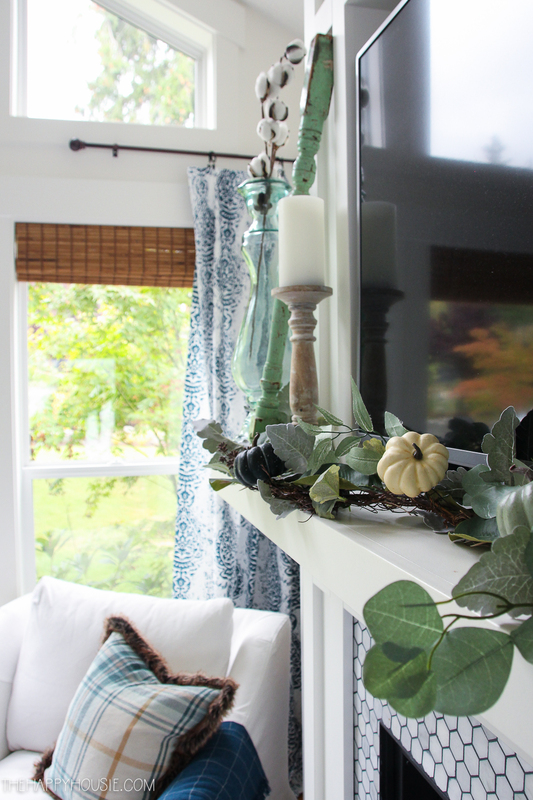 I love that you stay true to your color palette for Fall decorating! 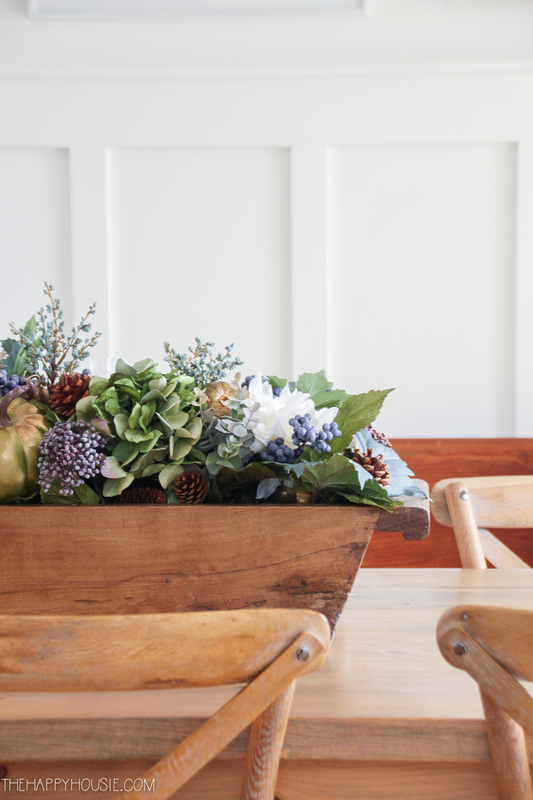 The mix of blues, greens and natural materials is beautiful, and so calming. 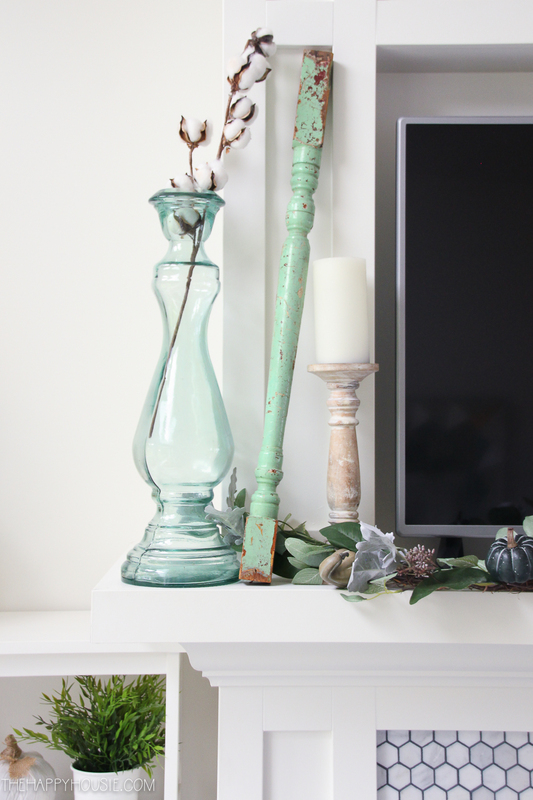 I’ve been doing more of decorating with my favorite color(s) and it’s such a fun way to play with decor. Thank you for sharing at our Merry Monday party. 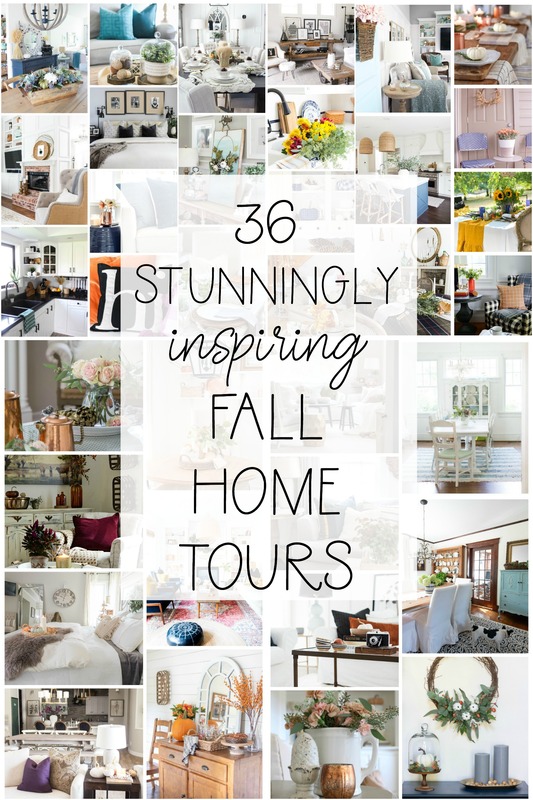 I’ll be including your beautiful home tour in my Party Features this coming week. what a beautiful home! 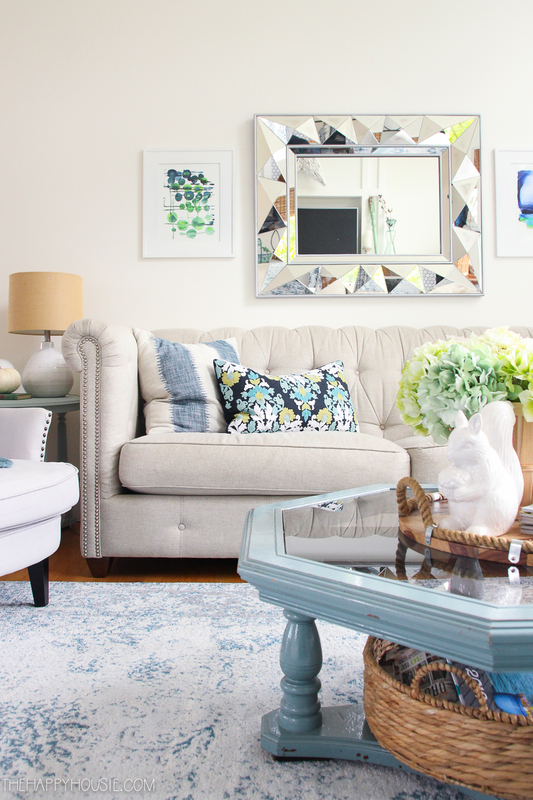 Love your couch! Where did you buy it or what brand is it? Thank you for sharing! Your home is so beautiful! The blue and green is perfect! Beautiful tour, Krista! The dough bowl centerpiece is stunning!! Love the colors! 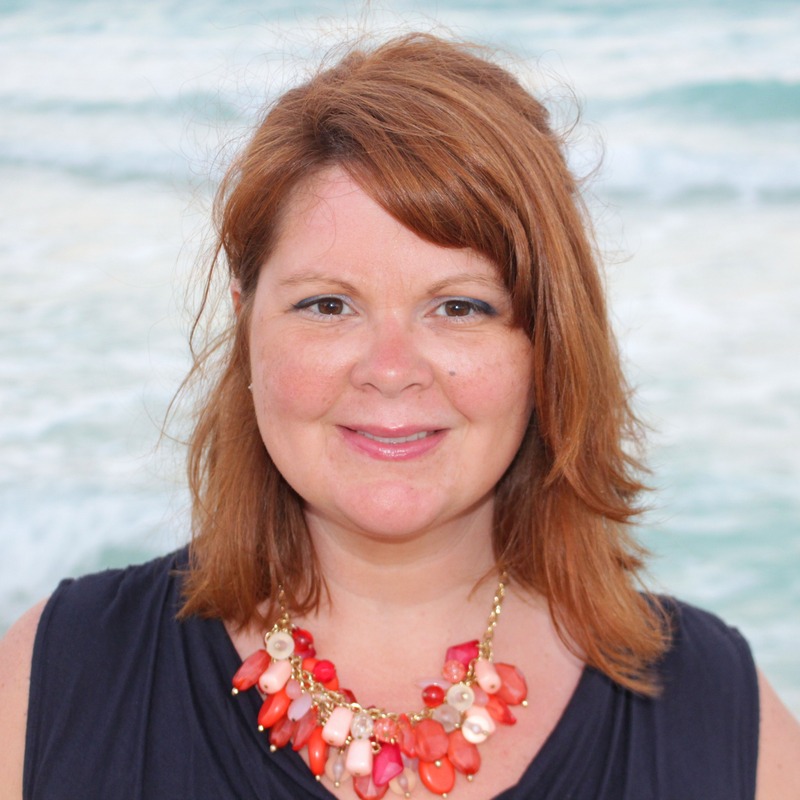 Thanks for including me in this blog hop! Love your blues and greens for fall, my friend! Thank you so much for keeping us all organized for the tour this week! You are the best! 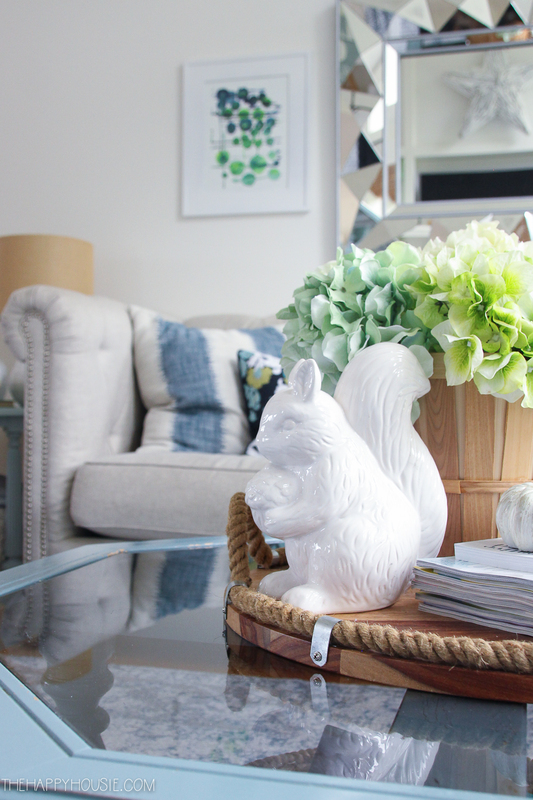 Your home is so fresh and bright! 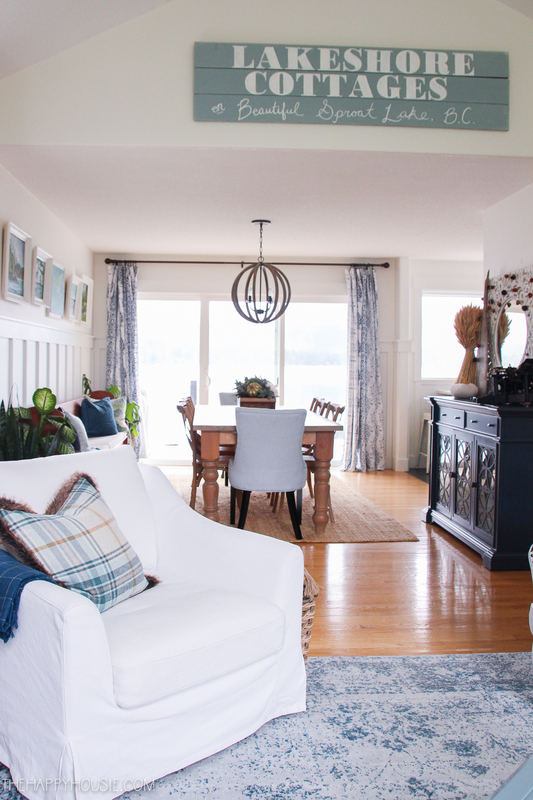 Where did you get your curtains in your living room and also your pendant lights in your kitchen. Love them! 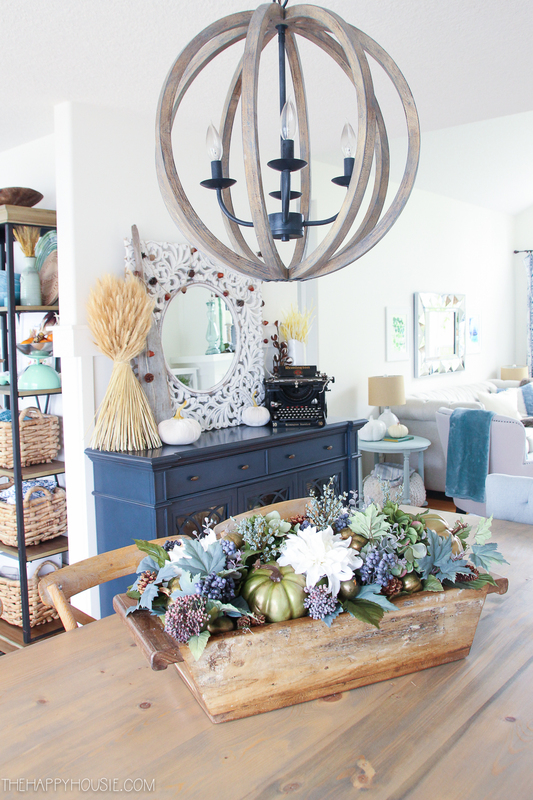 Your home is so gorgeous, Krista! You know I’m always drooling over all of the blues! And I love that Harvest Time printable. Adorbs!! Thanks so much for hosting the hop again. I love it every season!! Your house looks so good Krista! 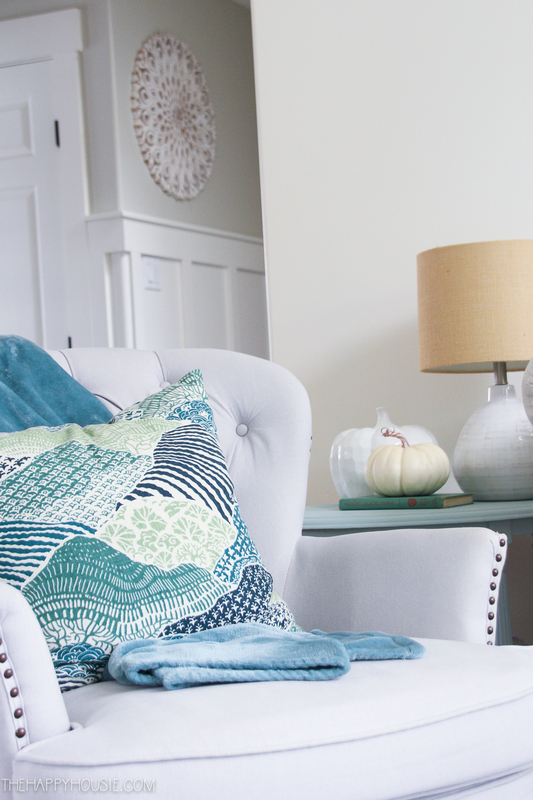 You’ve done such a good job of keeping the blues and yet warming things up for fall. 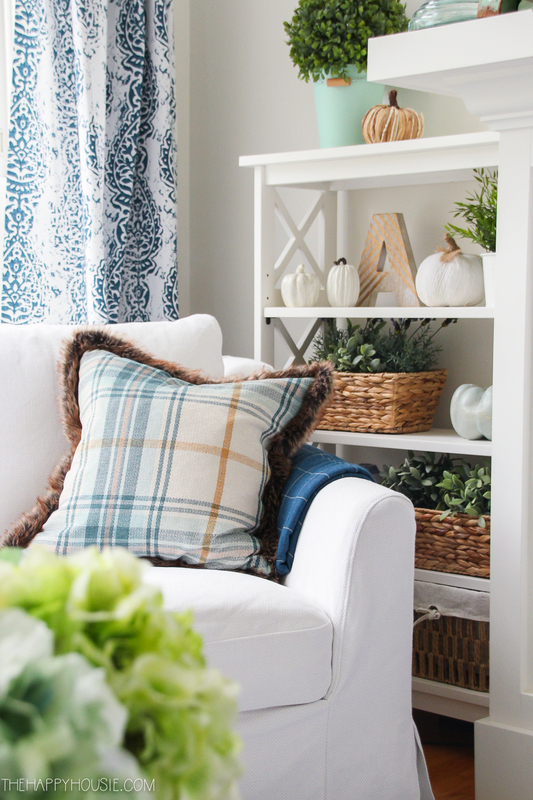 And I especially love those plaid pillows! Thanks again for having me on this tour! Love joining you and all of the talent in this group! I never get tired of your tours, Krista! The cool colors you use are always so fresh. 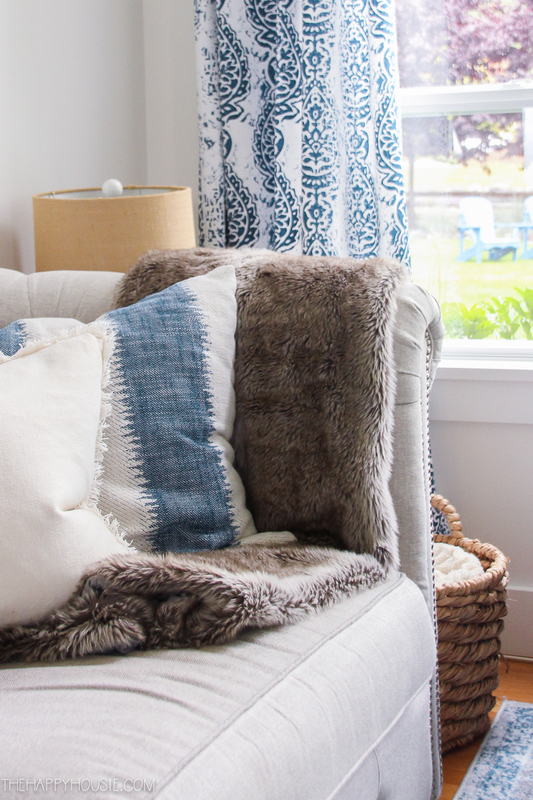 I love the texture you’ve added too with the fur throws and pillows. Beautiful tour, friend! 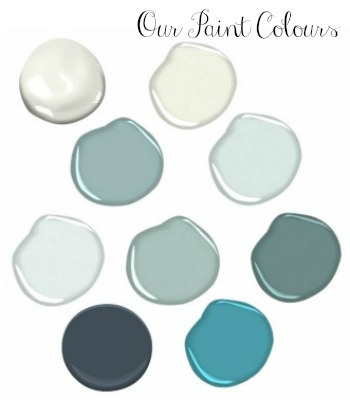 Love love love your colors! 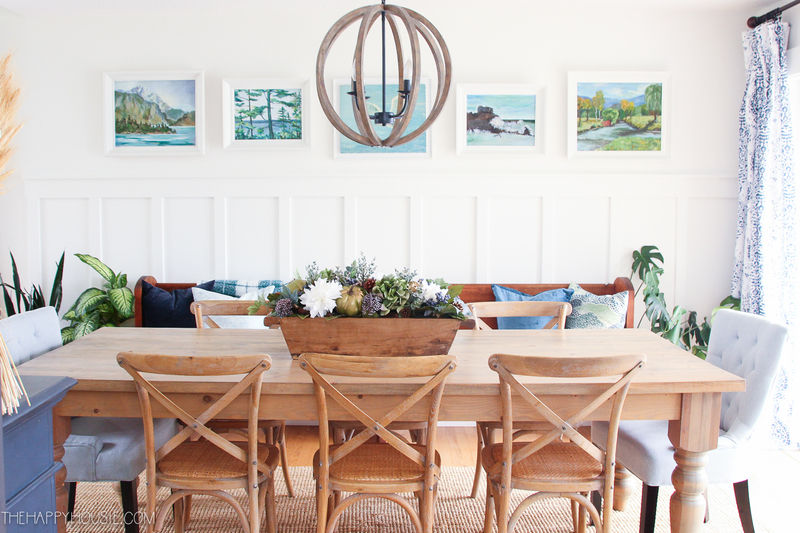 I have very similar in my home but you put everything together so beautifully. Thank you for a beautiful tour! 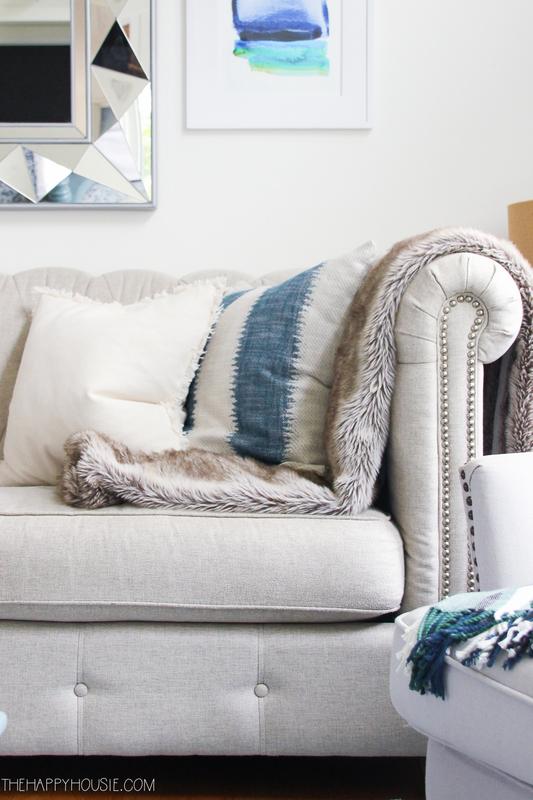 Love those pillows with the fur; where are they from? Hi Sue! I picked them up at HomeSense (much the same as Home Goods, if you have one nearby). Wish I had an easier source for you! 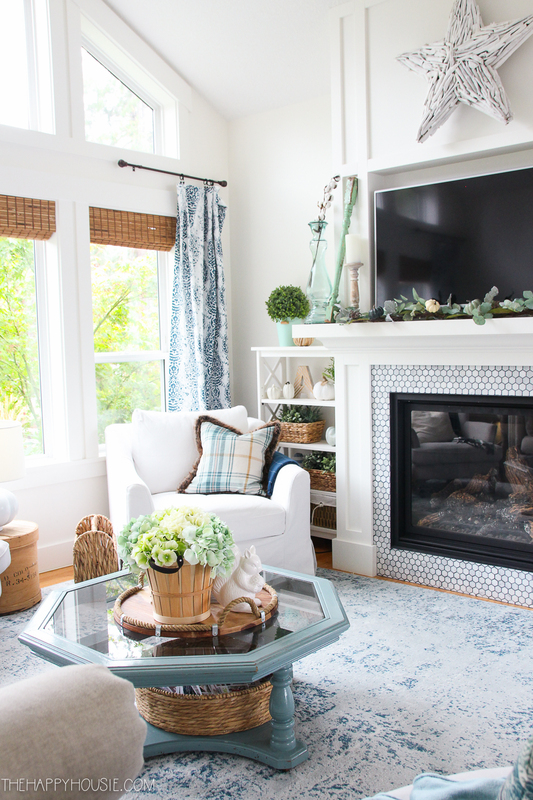 You managed to keep your home looking fresh and cheery, while still being warm and inviting. A perfect balance for the fall season. Beautiful! So pretty, Krista! 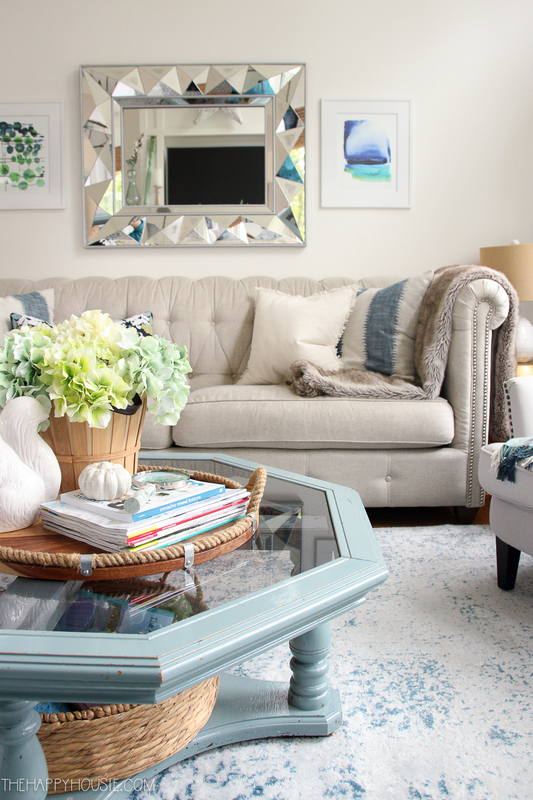 I love the color scheme and adore that mirror above your tufted sofa! I don’t think I noticed it before although I visit your blog often. Love your beautiful home. It’s so weird because it isn’t something I’d normally consider fall decor colors but I actually love it now that I see it in your posts! 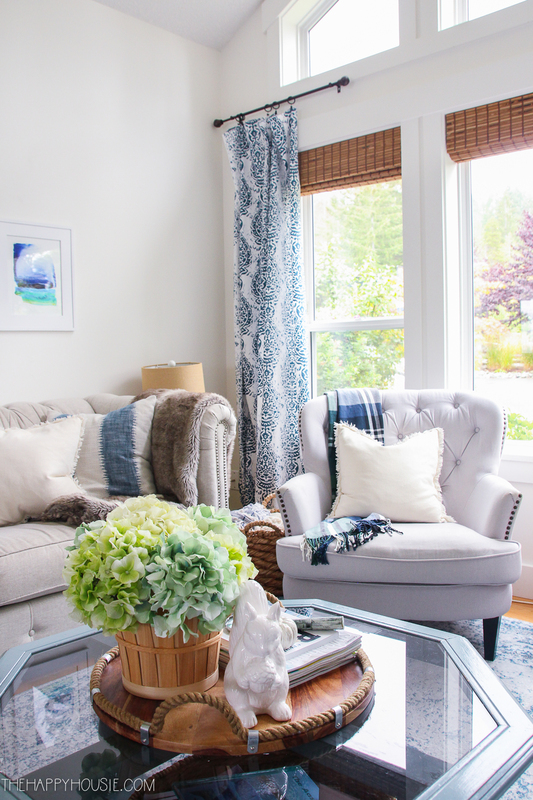 Your home looks so inviting, Krista! 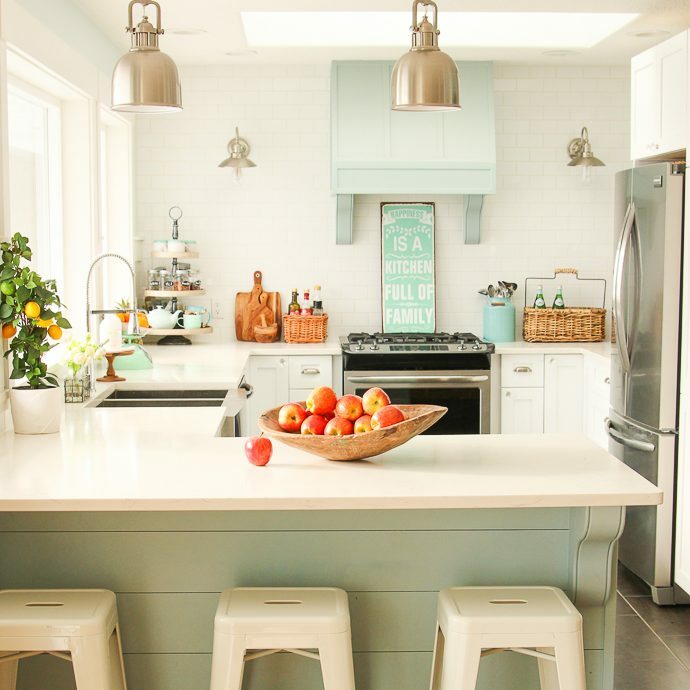 The blue/green color palette is so calming. Thanks again for having me on this tour! 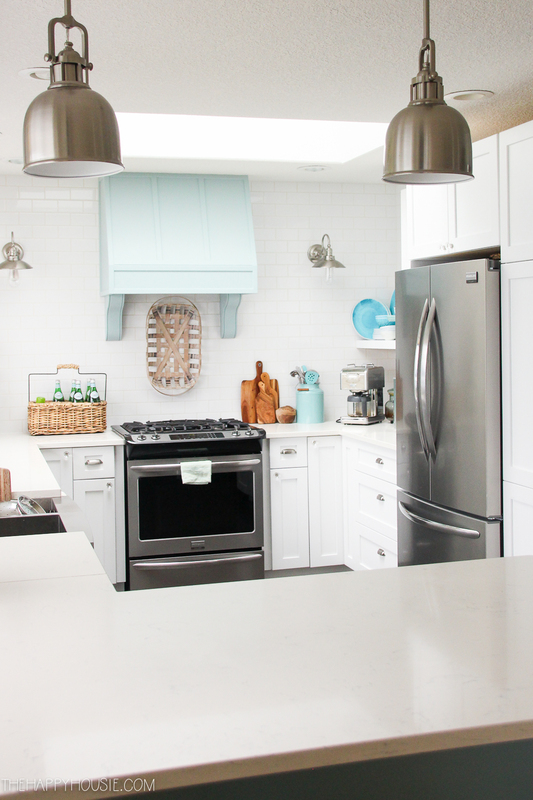 Krista, I always love your home tours and this one is no exception! 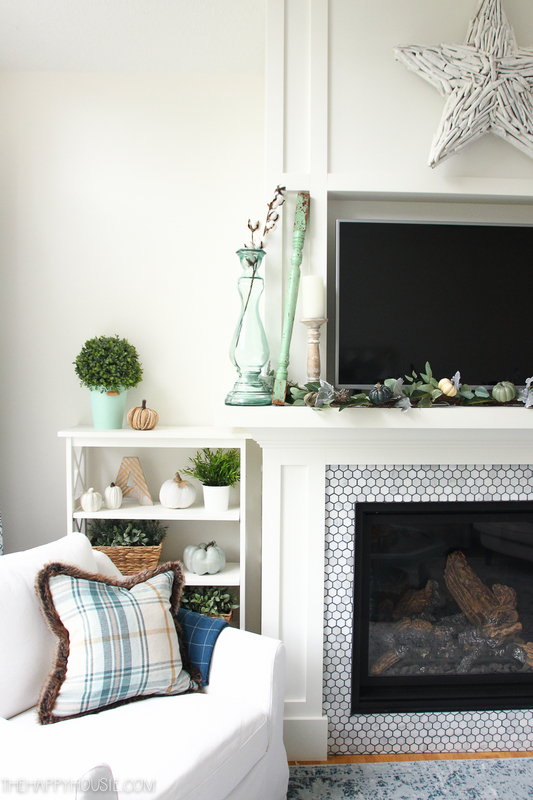 The colors are beautiful as always and you have the perfect amount of coziness for this season! I always enjoy your home tours. As a fellow color lover, I know my eyes are in for a feast. I wish I could say it is getting chilly here, not yet. The hurricane didn’t cool things off. Up in the 90’s today. Enjoy your chill. 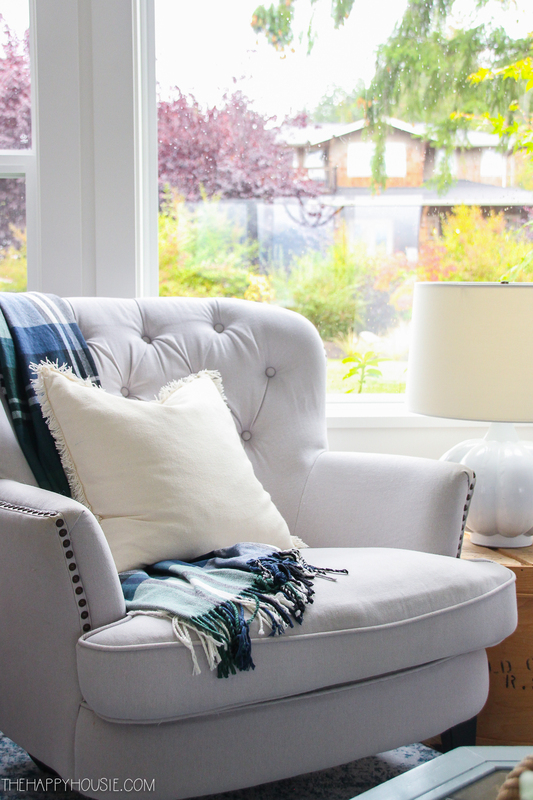 I will be thinking about you getting all comfy cozy when the first day of fall arrives.